If you run a business, you need to make sure you protect yourself financially and one of the ways to do this is with a comprehensive business insurance package. 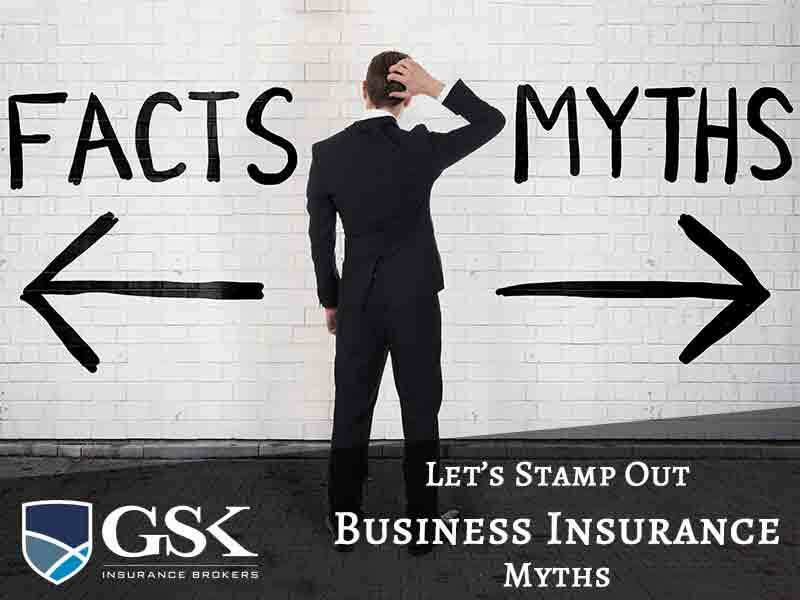 Unfortunately, there are quite a few business insurance myths that we hear all the time that can potentially impact your decision-making when researching the best policy for you. Today, we’ll debunk some of these myths, so you know the facts. We get it – when you’re running a business, it’s understandable that you want to cut costs where possible and a lot of people think that saving money on your insurance is a great way to lower your overheads. Although it’s true that cheap insurance is good in the short term, it can have serious long-term financial implications. If you discover down the track that your cheap insurance doesn’t offer very good cover at claim time, it can cost your business some serious money. Be sure to check that your cover is right for you, and not just the cheapest option. This is a very common one where people assume that because their business is only very small, they don’t need to worry about having insurance in place. Unfortunately, this isn’t the case and a lot of small businesses get caught out with too-little cover. Small businesses have their own unique set of risks and are often even more in need of insurance as they don’t have the cash flow of larger businesses to cope with expensive claims. Make sure you’re covered, no matter the size of your business. So, you work from home – surely you don’t need insurance cover, right? Wrong. Although there are some forms of cover that won’t apply to you if you work from home, you definitely need to have insurance in place to protect yourself. For example, if you have clients visiting your home, you must have public liability insurance in place to protect against any injury or damage that occurs whilst they’re on your premises. If your business has a specific job and a contract in place, it’s easy to assume that this negates the need to also have insurance. After all, the contract terms are pretty specific and are in place to protect you. However, what would you do if you were accused of breaching the contract? How would you afford to defend the claim or pay damages? It’s for this reason that you need to also have insurance cover, even if you have a contract. GSK Insurance Brokers can help you navigate an increasingly complex world when it comes to business insurance. We’re the point of contact for all of your insurance-related issues, from taking out your policy to supporting you at claim time. Our experienced brokers will analyse your needs, identify your risks and provide a business insurance quote that’s tailored to meet the needs of your business. For personalised business insurance Australia, speak to GSK Insurance Brokers today on (08) 9478 1933.